The call was put out for Johnny Majors’ University Of Pittsburgh defensive coordinator and recruiting whiz Jackie Sherrill who would make Washington State his first head coaching job. The former Bear Bryant Alabama player had been on two National Championship teams and then served Bama and Frank Broyles at Arkansas as a GA. He helped Majors rebuild the programs at Iowa State as defensive coordinator and Assistant Head Coach and at Pitt. 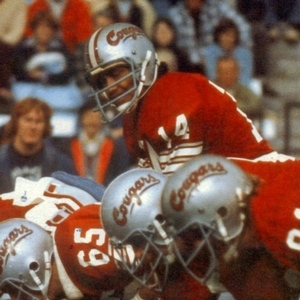 He dressed his Cougars in a new uniform that featured a silver helmet with a one-inch white center stripe and one-half-inch crimson flanking stripes though astute observers noted that some of the clear shell helmets sported three-quarters-of-an-inch crimson flanking stripes. The helmets had a memorable script “Cougars” decal outlined in black, on both sides. With All PAC soph QB Jack “The Throwin’ Samoan” Thompson at the helm, Sherrill announced that he would in fact throw and Thompson set five conference records, ranking second in the nation in passing while completing 209 passes for 2762 yards. Mike Levenseller and Brian Kelly were the primary targets with Levenseller also setting a record with 1124 reception yards and winning All Conference notice. Rugged Dan Doornink headed the running attack but also caught fifty three passes. The aerial circus was neutralized by a poor defense despite the hard work of NG George Yarno who got to face off against his brother John in the Idaho game, and Sherrill finished his first and only season with a 3-8 slate before heading back to Pitt to take Majors’ place. His notable success at Pitt, Texas A&M, and Mississippi State produced many All Americans, post-season bowl appearances, and controversies at every stop yet he was considered one of the nation’s best collegiate motivators. Warren Powers brought a lot of playing experience and the pedigree of being a trusted Tom Osborne Nebraska assistant to the head coaching post at WSU. A two way backfield star on Bob Devaney’s first Husker squad, Powers had parlayed an All State High School QB nod in Kansas City into a solid playing career. His six years as an Oakland Raiders defensive starter honed his knowledge and instincts and he seemed like a good choice for the Cougars. 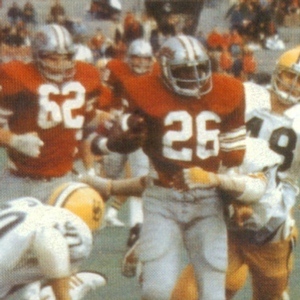 With the ‘77 season opening at Nebraska, the script was written perfectly as the Huskers, in a national level upset, lost to WSU 19-10 in Powers’ debut. QB Thompson continued his heroics finishing second in the country with 2372 passing yards on 192 completions. The Veer-T Offense featured receivers Mike Levenseller, an All Conference pick who went on to a pro career that included stops at Buffalo, Cincinnati, and in the CFL, WR Brian Kelly, sprinter Tyrone Gray who had a five year CFL career, and TE Eason Ransom who passed through three NFL teams in his seven year career. Kelly was the CFL Rookie Of The Year and then became a Hall Of Famer. FB “Dr. Dan” Doornink played his rookie season with the Giants and then became a fan favorite in Seattle for seven seasons before entering the medical profession. Doornink and HB Mike Washington provided the run game with Washington doubling as a top return man. NG George Yarno won a number of post-season awards and once again All Conference punter Gavin Hedrick was among the nation’s best. LB Don Hover was good enough to play with Calgary in 1980. “Carpetbagger” was a term thrown around when Powers announced that he was leaving WSU after one year, just as Sherrill had, for the greener pastures of Missouri. He took Mizzou to four consecutive bowl games and eventually retired to the business world. He briefly returned to football as the head coach of the National Indoor Football League Show Me Believers who called St. Charles, MO home.